NCNAA has paved the path for her to learn English, learn in a better environment and study to become a doctor. Sitting toward the front of her class, Nabila types on a Chromebook, adding more information to an assignment. The classroom she’s sitting in is silent besides the echo of her fellow classmates typing on their laptops and the soft murmur of her teacher helping a student put together his Powerpoint. Long strings of colorful flags hang across the ceiling, an ample sized television hangs on the wall and a lot of labeled flashcards taped to random objects spread themselves throughout the room. This classroom is nothing like the old one she came from in Afghanistan. Nabila moved to the U.S. when she was 12 years old, currently she is 14 years old and enrolled the NCNAA. According to Nabila, it was hard for her to adjust to a school that was so different from her old setting. At her old school in Afghanistan, the boys and girls were separated into two different schools, there was no lunch provided in the school day, there was no bus to take the students to school. Students had to walk, and, according to Nabila, the teachers wouldn’t help students, rather they would hit them and publicly shame them if the student didn’t know an answer. In Nabila’s new school, she receives educational help from her teachers and fellow students. Nabila says ESOL teacher Keary Ritchie has helped her to learn English in the best way she knows possible: with patience. One of the ways Ritchie helps is if a student doesn’t know a word that Ritchie is explaining, she will search for a photo to show the students to help them understand what the word means. Once she gets through schooling in America, she plans to go back to work as a doctor in Afghanistan. According to Ritchie, Nabila makes a concerted effort to understand what’s in front of her while working. She helps other students in the room, starting with a girl who comes from the same area as her. She goes around to other tables of students and Ritchie considers her one of the leaders in the room. One of Nabila’s best projects she has made is a Powerpoint on the child activist Malala Yousafzai. Nabila chose Malala because she comes from the same area as she’s from. The point of the project was to test to see what knowledge the students could take and interpret. She included various photos, detailed charts and a clean layout. She looked at discrepancies with girls in the education system and wanted to get a grasp on what that problem was. One of the bigger problems she talked about was how the majority of girls in parts of Southeast Asia aren’t attending school anymore because of poverty, war and gender discrimination. The students gave an oral presentation and, according to Ritchie, Nabila was genuine and confident. She paused during her presentation while explaining something and asked students if they understood exactly what she was trying to convey. A current project she’s working on is a presentation on a certain type of animal. She chose the Orca whale as her animal. Students find facts, specific details and comparisons about the animals and write structured sentences about them. They then will take a manila folder and color their habitat, making a small visual presentation. Ritchie’s goal is for her to write good sentences and speak clearly to the class. Nabila will graduate in December 2018. From there, she will pick a high school to go to in the St. Louis area, but before she makes any decisions, she wants to discuss it with her family. While she is still in the process of deciding, she wants to choose one that will assist her the most with achieving her dream: becoming a doctor. At NCNAA, she learns about anatomy, which helped peak her interest in becoming a doctor. Five years from now, she wants to be in college in the St. Louis area, studying and preparing for her future outside of school. 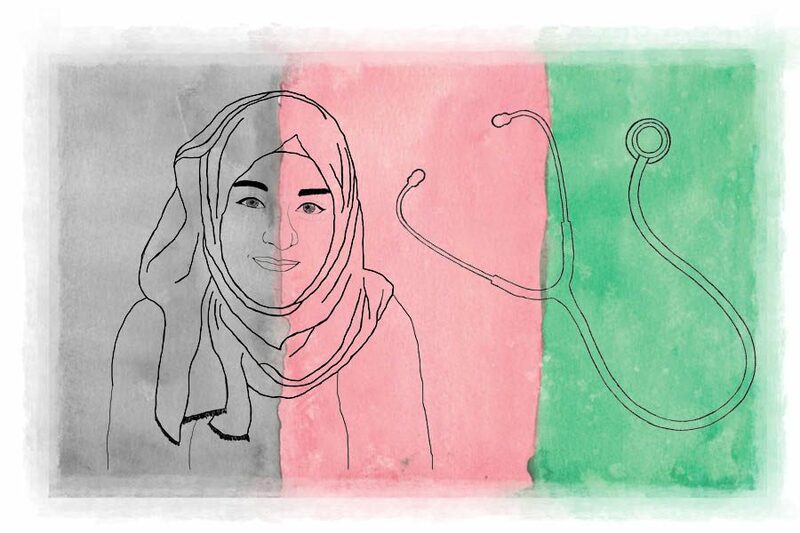 Nabila wants to become a doctor in the OBGYN field because in Afghanistan there aren’t many women doctors. A lot of girls don’t go to school, so they don’t get the chance to become doctors when they get older. This results in a lot of women giving birth in unsuitable locations. Overall, Nabila is thankful for the opportunities in education she has received in the U.S. She believes she has gotten the chance to learn in more efficient ways.